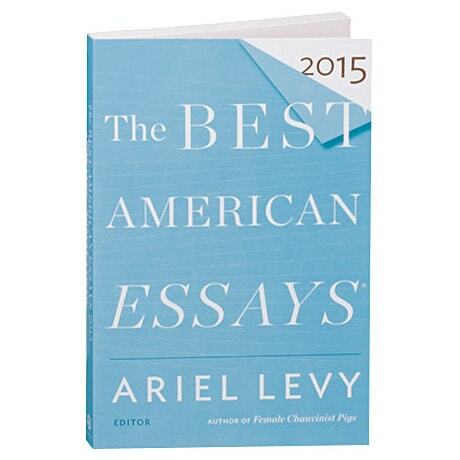 "Writing an essay is like catching a wave," posits guest editor Ariel Levy. "To catch a wave, you need skill and nerve, not just moving water." This year's writers—including Hilton Als, Roger Angell, Justin Cronin, Meghan Daum, Anthony Doerr, Margo Jefferson, David Sedaris, Zadie Smith, and Rebecca Solnit—have crafted 22 pieces awash in a diversity of moods, voices, and stances. Leaving an abusive marriage, parting with a younger self, losing your sanity to Fitbit, and even saying goodbye to a beloved pair of pants are all unified by the daring of their creation. As Levy notes, "Writing around an idea you think is worthwhile—an idea you suspect is an insight—requires real audacity." Since its inception in 1915, the Best American series has become the premier annual showcase for the country's finest short fiction and nonfiction. For this edition, as for the others in the series, the series editor first reviewed hundreds of periodicals from the previous publishing year, selecting between 50 and 100 outstanding works, before the guest editor made the final selection of the very best pieces.